1- When to use UniversRadio Transponder ? 1- When to use UniversRadio Transponder? UniversRadio Transponder (UR IFF) is a virtual MODE1, MODE3 and MODE4 transponder and Identification Friend or Foe. 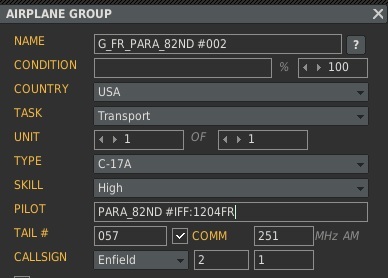 UR IFF is not needed for A-10C, C-101EB, F-5E3, M2000C, UH-1H and F-14B, in-game cockpit panel settings are taken. An IFF interrogation works only during a radar locked on, and from FC3 flighters. an ATC software (LotATC) can use IFF or Ident status to manage air circulation. You will find UR Transponder shortcut in the Windows start menu UniversRadio. Which actions can be done ? And, how to do ? You can customize an IFF code for AI aircrafts. 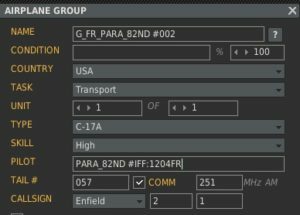 Add #IFF:xxxxcc at the unit name from DCS mission editor. xxxx is the mode3 code and cc is the coalition : UN (unknown), EN (ennemy) or FR (friendly). So, when an interrogation will be done on this A/C, IFF respons will be -- 1204 FR. You can change IFF keys by modify ..\Saved Games\UniversRadio\UniversRadio.ini file (read included comments). This key is a secret share of your coalition. An IFF interrogation must be done during a radar locked on. 2According to IFF mode 4 ‘Secure Code’ in UniversRadio Control Panel. 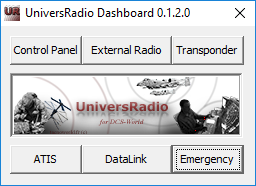 When both, UniversRadio ExternalRadio and UniversRadio Transponder are launched, UniversRadio Transponder is displayed below ExternalRadio window. UniversRadio Transponder window can be moved. When UniversRadio ExternalRadio has focus, both windows display frequency and code in orange color.